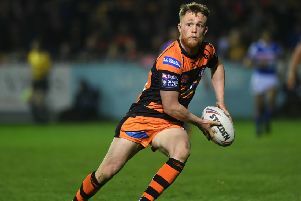 Featherstone's Taylor Hardwick scored two tries. Picture: Matthew Merrick. Taylor Hardwick bagged two tries as Featherstone Lions under 13s produced a tremendous all-round team performance in difficult conditions to beat a dogged Shaw Cross side 20-4 to reach the BARLA Yorkshire Cup semi-finals. Despite playing up the slope and facing a strong wind in the first-half, Lions took the game to their opponents, with half-backs Josh Milthorpe and Charlie Harris dictating play and forwards Hardwick and Taigh Newman also in impressive form. Lions were unfortunate when Jack Bower had an effort harshly ruled out. With both defences in good form, chances were few and far between. Lions finally broke the deadlock shortly before half-time when Hardwick and Newman made good breaks to pave the way for Harris’ clever pass to send Findlay Gill racing over at the corner. From the second-half kick-off, Shaw Cross knocked on and from the resulting scrum Hardwick raced over and Milthorpe goaled. Shaw Cross hit back with a disputed try to reduce the arrears to 10-4 and then put Lions’ line under tremendous pressure with the help of a number of dubious penalties. Featherstone’s defence held out superbly, with Alfie Sales, Leo Brown, Kai Slatter, Spencer Atkinson, Milthorpe, Newman and Hardwick to the fore. Good runs out of defence by Elliott Bell, Bower and Gill saw both Harris and Newman stopped short before Hardwick ploughed over from acting half and Milthorpe added the extras. Lions were now well on top and they completed the scoring when Harris’ kick was collected by Harrison Fitzpatrick whose clever off-load sent in Newman. All Featherstone’s players earned top marks for a disciplined display in tricky conditions.